The Lutheran Church—Missouri Synod began supporting mission work in the Democratic Republic of the Congo (DRC) in 1984. 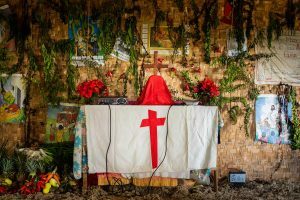 The LCMS works with the Evangelical Lutheran Church in Congo Manienga-Kivu Diocese, which has nearly 20,000 members served by 20 pastors and 54 evangelists, and the Evangelical Lutheran Church of East Congo, which has 10,000 members served by nine pastors. Currently, Lutheran congregations receive support for the theological education of their pastors by the LCMS’ support of the Lutheran Center for Theological Studies in Dapaong, Togo, which serves the French-speaking West African Lutheran church bodies of seven countries: Togo, Ivory Coast, Guinea, Benin, Burkina Faso, Congo and the Democratic Republic of the Congo. The LCMS currently assists families displaced by conflict in eastern Congo with food, cooking supplies, blankets and clothing.